Poorly managed streets cover almost every corner of Greenwich borough and much neglect abounds. This is bringing down many areas. Local community group East Greenwich Residents Association (EGRA) have been doing a great job highlighting the very poor condition of many streets in their part of the borough, which is far from unusual. They have produced a report highlighting various failures in creating and maintaining decent areas people can take pride in. It does a superb job clearly highlighting just how poor current street management is, and what can be learnt from elsewhere. Greenwich council’s Highway’s Department, responsible for not only roads but paving, street furniture, lighting and more, still show very little understanding of good design and what is needed to improve areas to make life better for residents, business and pedestrians including the disabled and parents. Many feel the effect of these failures. Monitoring assets is one of the Highway Departments biggest problems. Too often we see fences, walls, railings and more become damaged or broken but then left for months, if not years. What’s badly needed is routine auditing of streets to see what needs replacing and what can be removed. Broken fixtures are left even on major roads and town centres, so it appears this just isn’t happening. It’s not a result of budget cuts either. This long pre-dates 2008 and points to real problems with the culture in some departments. 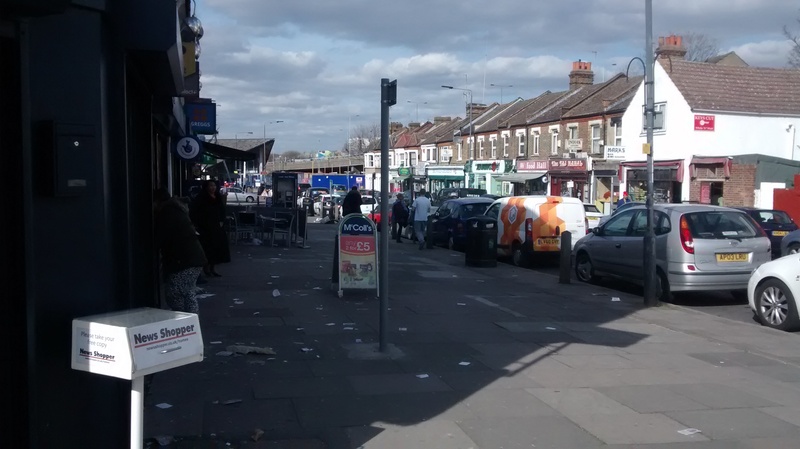 As well as damage there is WAY too much clutter littering the streets which is a legacy of dated regulations from the 1970s and ’80s, long since abolished. But hopefully changes may start to happen. Some allies of former Greenwich council leader Chris Roberts, who oversaw such widespread decline and neglect across the borough whilst in charge from 2000 to 2014, have lost important roles in charge of various committees. The head of the Planning Board has changed hands, with Ray Walker replaced by Mark James. Changes have also occurred over at the Highway’s scrutiny committee. The committee tasked with keeping tabs just didn’t seem up to the job given years of sub-standard department work. It’s former chairman was Norman Adams who is to be replaced by Aidan Smith. The practices of the department need much better scrutiny. You don’t need miles of guardrail lining every single junction or busy area if it narrows paving and puts cyclists at risk. The rules in the ’70s may have stipulated it but not in 2015. It’s wasteful to install and impedes pedestrians and vulnerable users, but Greenwich council can often seem oblivious to changes beyond their boundaries. And where it is needed only the worst quality, least attractive seems to do. It’s as though the Highways Department’s budget is spread thinly and quantity over quality is in evidence. Instead of targeting resources where needed and doing a good job in select areas, the Highways Department instead install much rubbish that just isn’t needed in most instances. And still it goes on, wasting money and achieving little. Thousands were recently spent on yet more guardrail by Waitrose in Greenwich (the cheapest type only of course). The junction is now a cluttered mess. When I passed pedestrians were being placed at more risk by their installation. Just metres away the nearby council estate entrance has been a mess for at least six months with the top of a wall having fallen off and remained on the paving, with masonry and bricks falling out of other areas. No money to improve that it seems. The hundreds of people living in that tower block don’t deserve the bare minimum in maintenance? Such bizarre priorities. Most authorities in the UK are removing railings. Greenwich spends thousands putting more in. When other authorities do tend to put them in they use materials that are more sensitive. Greenwich choose utilitarian rubbish and can’t be bothered to even paint it. They’re decades behind. And if they can’t do a half decent job at the edge of a world heritage site then there’s no hope for areas like Plumstead or Coldharbour without serious changes in behaviour. So spreading the budget thinly, and unnecessarily, by placing railings and signs anywhere they can means that the default lighting, paving, landscaping and fencing is too often the cheapest and nastiest they could procure. Look at the photo below. Why have a small number of attractive bollards when you can install a dozen ‘cheaper’ wooden ones? Except you’ve saved nothing here but made it look cluttered and created more obstacles for pedestrians. Half the time these types of bollards are leaning at an angle on various streets as they topple so easily, yet the Highways Department’s guidebook must state they’re stuck up on every street whether needed or not. Carrying out a rolling process of street audits and repairing or removing redundant street furniture does not cost the earth. What isn’t needed can go. How much would it have cost to audit the parade of shops above on an annual basis, then remove unneeded items and improve what is needed? Very little if the will was there or the way the department operated changed so this was a priority. It’s been like that for 20 years. This is outside a station that is one of the busiest in London and sees tourists passing through. Greenwich council have often said Crossrail’s coming as if that excuses years of neglect, and now we know it won’t even cover the whole main street directly next to the station. It should never have seen 20 years neglect and the prospect of millions to do routine work. And what about Plumstead station, or many others? Same story there but no plans, even though it would be easy, cheap and achieve some pretty big immediate improvements. Area by Plumstead station. Bodged improvement works. No visual cohesion. 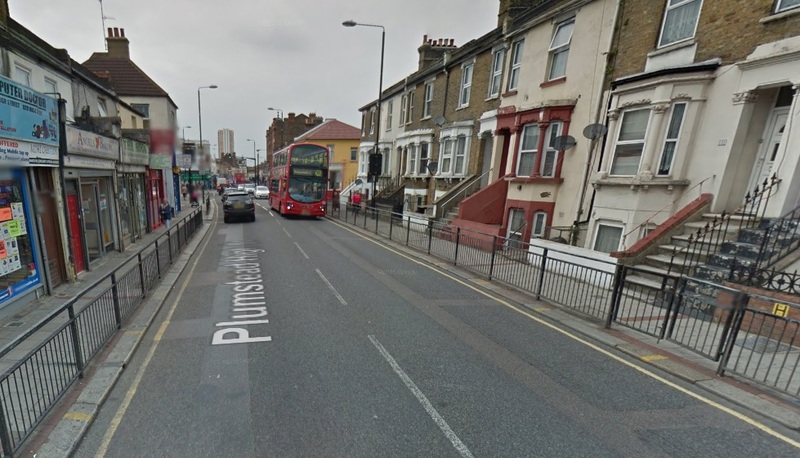 For a minimal outlay a better place could be created at Plumstead. A community’s sense of well being is increased in an attractive environment. People also see that the council gives a damn. If people see the authorities care then they tend to as well. Crime is lessened. Business prosper as people want to stay and visit. It just needs drive and focus. As the Highways department have floundered and rendered many streets a mess the scrutiny from the committee overseeing them has been lacking. Many more questions should have been asked about their routine failings and more demands placed on them. The forthcoming change of scrutiny chair could be just what is needed. Councillors need to demand change and ensure working practices are altered within departments to improve failures blighting many areas. Ask senior members of various departments tough questions and crucially follow up to ensure changes are pushed through. I wish the new chairs of committees all the best in holding failing departments like Highways to account. What we had before has not worked. Alongside that it’s heartening to see more community groups created and putting pressure on. EGRA are a great example but this also extends to the ever-increasing number of online groups covering local areas on sites like Facebook with thousands of members. For example, Plumstead People have many members who have had to actively sign up and be approved. It’s not the same as just clicking ‘like’. It’s a similar story with groups covering Woolwich. This, along with twitter and blogs are helping to bring people together and publicise issues, as well as directing complaints and comments to the council and Councillors. People have been contacting me about their local area and I’ve directed them to local politicians so they can let them know it’s not good enough. With all these things happening, and changes with the council scrutiny committees, the future looks better. It’s high time Greenwich council caught up with other areas and gave people decent places to live. With the sheer number of comments online its clear that the poor state of many places concerns lots of people, and as more join groups and twitter it isn’t going away. But we shouldn’t need community groups alone to push for change. In some areas people are apathetic, detached and just too cynical for local groups to emerge anytime soon. Years of being abandoned have taken their toll. It took a very poor new development proposal for EGRA to spring into life, but I just can’t see a group happening in say, Abbey Wood, anytime soon. So to rely on community groups alone to enact change is not the answer. We need departments that function well by default, and carry out high quality work led by good design principles as standard, so it doesn’t require a big concerted community push for improvements to occur. That will happen with pressure from elected representatives towards council departments. The irony is, the more the council takes the lead through competent departments in improving various areas like Abbey Wood, the more likely community groups are to appear as stronger communities emerge and people feel as though they’ll be listened to. I’ve lived in East Greenwich for 13 years now. In that time I can’t recall seeing much in the way of maintenance or improvement to the general area. I have experienced a significant amount of building though, all of it upward I.e. flats, and have dealt with the usual inconveniences during construction. I don’t see any change in services to cope with the more dense populus. Quite the opposite, I have seen essential services such as the trains struggle to keep up. Southeastern has consistently been one of the worst performing train companies in London the while time I’ve been here. Unfortunately I’m seriously considering moving away. There is a lot of potential here and it’s close to my spiritual home of Bermondsey where I grew up. Shame really. Millions have flowed into the councils coffers from all those developments. Very little has gone to improving the local environment. Greenwich have functioned differently to many boroughs, who spend a decent amount of money from section 106 money coming in on the vicinity of developments to improve the area and show locals that they gain something. In Greenwich it has all too often entered into a big central pot and then on various schemes with seemingly little to show for it. Payments from developers in the form of section 106 will shortly change to the Community Infrastructure Levy. All boroughs have had to make plans of what CiL rates will be, what the income will be spent on etc. I looked at where Greenwich will be spending this – it was incredibly vague and improving public realm seemed tacked on at the end. Having looked at other boroughs, many seem to give far more prominence to improving public spaces with the income when publishing plans. I do hope this is simply incompetence with the wrong people in the decision making roles, and not a case of somebody personally benefiting from what they’re doing. While I’m not claiming the later is true, it would not surprise me if it was. Interesting you mention the crumbling council estate near Waitrose. I’ve three times contacted the council about the large 7 foot wall that fronts Norman Rd (opposite the cement works) – there are cracks running from top to bottom and sizeable sifts in the bricks (you can fit your fingers through them). It won’t take much for it to fall and the weight of the wall would kill a child. They just don’t seem to care about this block. I know I am a fool to comment here and I suppose I should feel very guilty about a lot of this – having been the Councillor for East Greenwich until last May for 14 years. I don’t want this comment to appear as me trying to justify my own behaviour – and I agree I should have been more assiduous in trying to get repairs done. I was a backbencher throughout my time on the Council and as such was working only in my ward area- and needed to get staff to agree to get any work done. I can’t comment on anything else. Almost everything raised here and in the EGRA report are issues that have been taken up at some time before. I want to say that successive Town Centre Managers worked very hard and that it would probably be useful to look much more closely at why we seem to be where we are. Greenwich Development Agency, with advice from a committee of residents and traders. Development Agencies provide a quick fix – but they go before things need replacing and/or their mistakes become apparent. We need to look more closely at sustainability. (anyone in the area could put their views). It paid for a lot of new paving, moving the mural from the hospital wall and reinstalling it in a redesigned ‘Park’ and some other things. 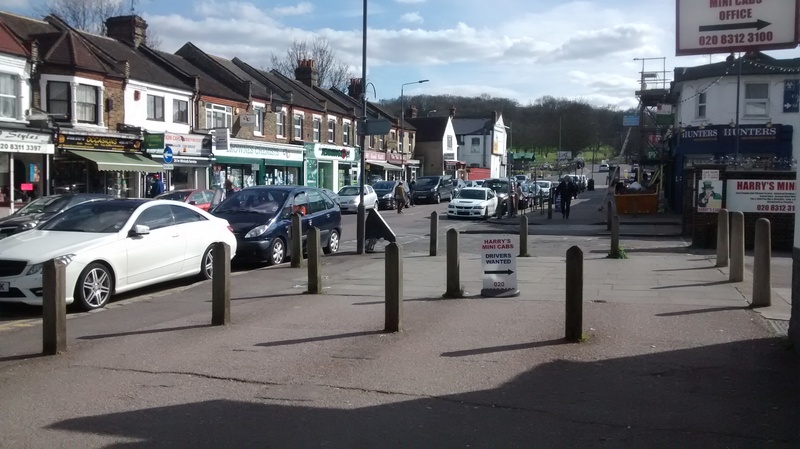 It did clear up some real clutter – BUT not all residents, or shopkeepers, welcomed changes. I think the lesson I leant then was that that there will be conflicting views about what should be in the streets and what they should look like. It is not difficult to find people who want nothing done apart from lots and lots of ‘security’ fencing, however ugly. Some people are extremely hostile to trees and some to any planting at all. It is also only too easy to get in a ‘them and us’ situation over advice from people seen as ‘newcomers’ or ‘outsiders’. It is seen as good if people care about their streets and feel some ‘ownership’ of them but working towards a consensus may not be easy. And please don’t take this as justifying lack of repairs, or the need for harder work in nagging at staff by elected representatives. Beyond that things need to be thought through very much more carefully. “I agree I should have been more assiduous in trying to get repairs done” says Mary Mills. Too right. If only Greenwich councillors could admit that when serving in their roles. Greenwich is a mess because of the council she served on. I’ve never read so many outrageous stories about petty infighting, mis-spent cash, ill-advised judgement, threatening phone calls, etc etc etc. Greenwich is one of the most beautiful London boroughs, run in the most incompetent way by a self-congratulatory few. A well considered article. I’d like to add that sometimes living in Greenwich, feels like living in a Stalinist local fiefdom. A political culture of complacency, secrecy, an elitist overweening sense of self importance.